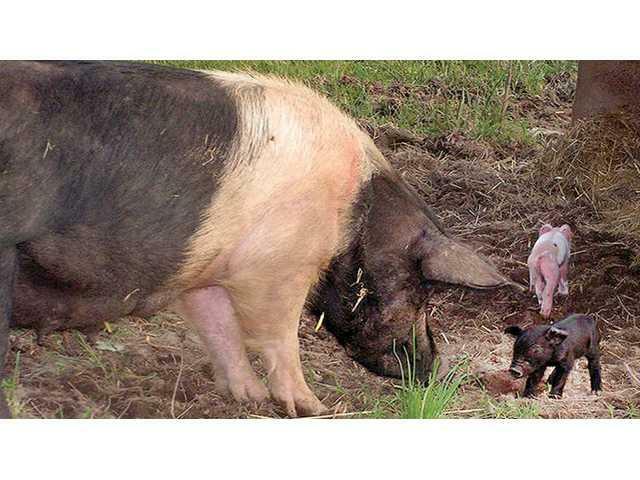 THIS PASTURED SOW keeps an eye on her piglets, while the family moves about the Turkey Ridge Orchard in Gays Mills. The orchard has years of experience with raising pastured pork. POSTED December 15, 2016 11:42 a.m.
Nearly 40 farmers interested in pastured pork production and forming a regional farmer’s cooperative gathered at the Crawford County Highway Department complex in Seneca on Wednesday, Dec. 7. The group viewed a video created by Joe Salatin, an innovative farmer-entrepreneur from Virginia’s Shenandoah Valley to kick off the meeting. Following the video, the group heard presentations from Jeff Swenson, Economic Development Specialist from the Department of Agriculture, Trade and Consumer Protection (DATCP), and Rod Ofte, General Manager of the Wisconsin Grassfed Beef Cooperative. Lunch – of course – was delicious pulled-pastured-pork sandwiches! Meeting organizer Mike Mueller was very happy with the turnout at the meeting. “There is no question there is a market for pastured pork, and no question that we are definitely moving forward,” Mueller said. At the meeting, names of potential farmer-members were gathered, and organizers plan to foster a way to move the conversation forward with online discussions and/or another meeting early in 2017. For more information, Mike Mueller can be reached at 608-412-0725, or by e-mail at pioneergardens@gmail.com. In establishing a producer co-op, DATCP’s Jeff Swenson explained there are seven basic steps: 1. Establish a steering committee; 2. Do a feasibility study; 3. Create Articles of Incorporation and Bylaws; 4. Create a business plan; 5. Secure financing; 6. Recruit members; and 7. Recruit staff. “The most important thing is to establish early on what you are, and what you are not,” said Rod Ofte, the General Manager of the Wisconsin Grassfed Beef Cooperative. “You have to have all the conversations with your members up front and get buy-in about the big things like production methods and farm gate pricing in order to create a sound foundation for your business and your marketing strategy. “You have to decide up front, for example, if you’ll allow members to continue to direct market on the side, if you’ll allow GMO feeds, if you want to market outside of the state, and so on,” Ofte explained. Ofte was happy to talk with the group and share some knowledge from the beef co-op, which is now over 10 years old and profitable. “Mike Mueller reached out to me when he began exploring a co-op, and we are happy to share ideas with you, and would be happy to consider the possibility of doing something together if that makes sense down the road,” Ofte said. “In the grassfed beef co-op, our mission is to provide the farmer-owners with a 20 percent premium over the conventional price. “If I had it to do over again, I’d do a better job of contracting, I would move immediately to tiered pricing based on grading, and I would have obtained more upfront funding,” Ofte told the group. Jeff Swenson of the DATCP cited a 2009 study done by the Shine Marketing Group in describing the market potential for a pastured pork product. The study showed that consumers will travel farther for what they perceive as a higher quality product, value taste and tradition, place a value on novelty, and like to have a relationship with the farmers who produce their food and hear their stories. Some of the challenges the study showed were that consumers can be stuck in their traditional shopping patterns, they may not be aware of options to obtain the products they prefer, the price may not fit their budgets, and they are concerned about food safety and health benefits. Key words in a marketing strategy for pastured pork, according to Swenson, are heritage, heirloom, safe, nutritious, humane, small and local. Trends show consumer support for pasture/grass-based production, exclusion of GMO feeds, gluten free, organic, sustainable, and nitrite/nitrate free. Swenson emphasized that it really boils down to taste in the end, and cited consumer response to differences between conventionally-produced and grassfed beef. The meeting started with Joe Salatin’s video and stimulated a lot of discussion about methods of agriculture, which foster the “pigness of pigs,” and allow them to express their natural behaviors. The video can be found at www.polyfacefarms.com. Polyface Farm originally began their pastured pork operation as a way to efficiently turn bedding into compost for an on-farm soil fertility source. Salatin’s video demonstrated how to create finishing pastures for pigs in forested land, and provided some history of how Native and European people originally incorporated the forests and savannahs into their agriculture. Crawford County Agriculture Agent Vance Haugen has a hunch most producers will choose to go with a more conventional pasturing method versus creating pastures in the woods as depicted in Salatin’s video. "I don't recommend putting pigs in woods that are in decent condition. It's risky for the soil, trees, and understory vegetation,” said Keefe Keeley, Co-Executive Director of the Savanna Institute. “On the other hand, pigs might be used to restore degraded land, especially places that were formerly plowed or severely overgrazed and are now overgrown with introduced shrubs like bush honeysuckle and buckthorn." Pastured pigs have potential to create an agricultural economic base in the county that will be good for the economy, and potentially for the environment as well. Crawford County’s farm economy has potential to experience benefit from adding pastured pork into its overall portfolio. “I think it will probably be relatively small, but any initiative that can put some more cash into a farmer’s pocket through diversification is a good thing,” Haugen said. And what is good for the economy is even better when it is also good for the environment. Methods of agricultural production, like grass-fed beef or pastured pork, which disperse rather than concentrate the manure from animal agriculture will help to protect the county’s groundwater that our underlying karst geology makes so vulnerable. In addition, more grass and pasture on the ridge tops is an effective way to slow down water runoff in extreme weather events and it can help to prevent or reduce catastrophic impacts. "The bottom line is we need more perennial vegetation to slow rainfall before it becomes flash floods. Back when more farms had dairy cows and other livestock, there was more pasture and hay ground that slowed the runoff and gave it more chance to infiltrate into the soil,” Keeley explained. “Planting a lot more perennials -- pasture, forages, apples, aronia, prairie strips, et cetera -- that might help our flood problem." “Each little bit of adoption of more sustainable practices is a success toward adding to the vitality of our rural communities,” commented Edie Ehlert, President of the Crawford Stewardship Project.